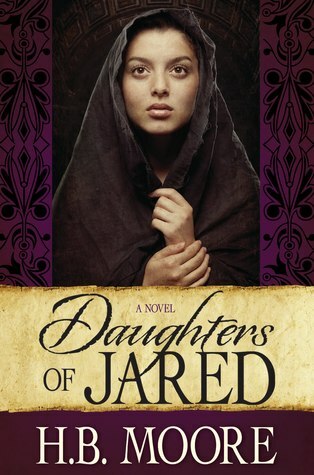 If you saw my post about E-Books for Review, then you might remember that Daughters of Jared was one of the recent selections. I received this book for free in exchange for a fair and honest book review. Summary (via HB Moore.com): Something a little different today...a video! Review (4/5 Stars): This is my second HB Moore novel and I'm really enjoying her writing style. She is a master at setting the pace of a story and creating such a vivid image that you can easily see everything play out before your eyes. Because the first book of hers that I read was set in Egypt I went into this book assuming the same thing. It was clear to me though, without it being expressly said, that this was actually set in Meso-America, a place and time that I know little about. The story of these two sisters and the men who impact their lives is fascinating. They are each so strong, and yet so heavily influenced by others. The decisions that Naiva makes are portrayed as being selfless and maybe even brave, but I think some of what she did was more out of fear. 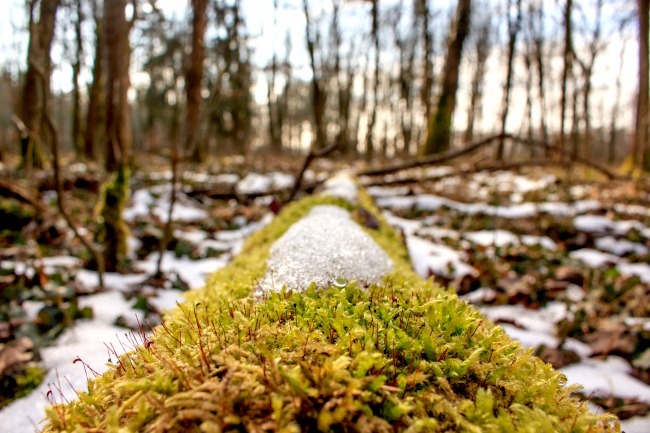 Fear of following her own path and living her own life. It's difficult to be critical of the story itself as it's based on the Book of Ether. I'm not at all religious so these stories are foreign to me, but even I know that there's little flexibility nor tolerance to make significant changes to any biblical story. I enjoyed the novel and I am becoming a fan of Moore's writing, but I don't like the feeling of being preached to, so I doubt that I'll read any of the other books from this series, however I'm sure that there's a huge audience out there who will greatly enjoy these books. When I visited Moore's website, I was astounded by the number of novels that she's written! If you look at her books in progress it looks like she released a book almost every month between 2014-2015! That's amazing, especially because her books are so good. If you'd like to sample Daughters of Jared you can read the first chapter HERE. If you enjoy a new twist on fairy tales, then you'll really enjoy First Light (Forever After Series) . Summary (via Goodreads): Seventeen-year-old Adrielle doesn’t believe in magic; she merely possesses it, though no one has ever mentioned that her unusual gifts—exceptional speed, a flair for fire, and an intimate knowledge of flora—aren’t things she was born with. When Adrielle starts a fire that burns down the family home, she must deal with both her grief and her siblings’ hurtful rejection. Review: This is a super fun book that is excellently written. I read it while on holiday and was surprised that I didn’t want to put it down. 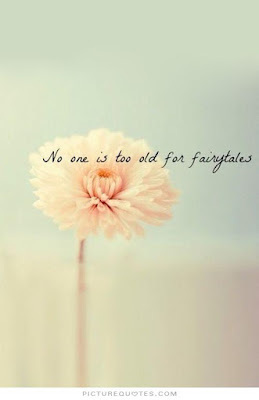 The author manages to easily mix historical fiction with just enough fantasy to create a wonderful land of magic inhabited by interesting characters that all comes together in an imaginative story that is anything but your classic fairy tale. I liked the way that the characters evolved. Adrielle, the main character, develops from a typical slightly rebellious young girl to a strong, self-confident woman by the end of the book. Even her love interest has an awakening and begins to see the world around him in a whole new light. I also liked the fact that the hero in the book is not the clichéd knight in shining armour and that the princess doesn’t just sit around waiting for him to find her and give her a kiss. She’s the person who is solving the problems and making things happen. She is the hero in every way. 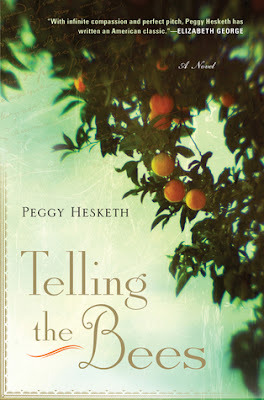 This is a fun and easy read for anyone who loves historical fiction and/or fantasy. There are no uncomfortable intimate scenes so I'd say this would be good for young readers as well. Overall, I really enjoyed this book and am so happy that there is a sequel to follow. I’ll definitely be looking up this author to see if she can whisk me away to other magical lands of the past. I'd just like to know where the heck that prince is?!?! Yahoo! Just past the half way mark in the year and I've already hit my reading goal! I think my reading goal last year was 42, but I fell dreadfully short thanks to Netflix and far too many nights binge watching my favourite shows instead of enjoying a good read to relax my mind. So, I played it safe this year and hoped to hit 32. Looks like I can jack that back up again and keep reading away! I love paper crafting. 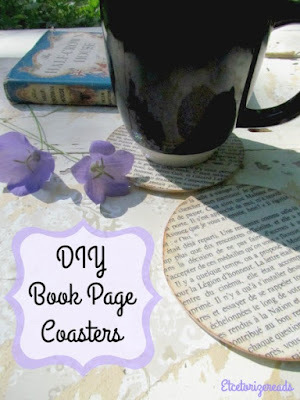 I love it even more when something I make is actually useful....like these easy to make Book Page Coasters! 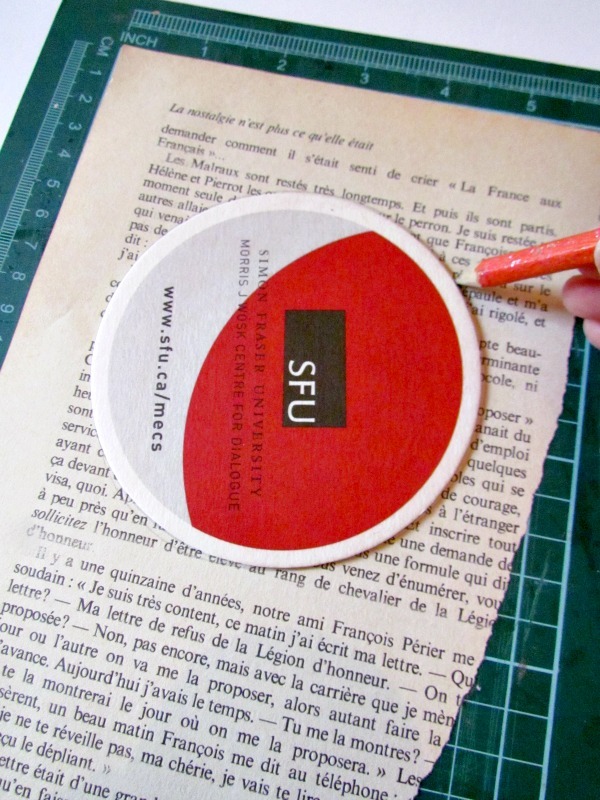 1) These unused coasters were left on my table at after a meeting so I slipped them into my stash knowing that eventually they'd come in handy. If you're not a thief like me, you can just cut a shape out of heavy cardboard/bristol board. 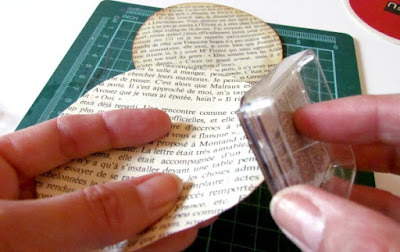 Then just trace the shape onto a book page. 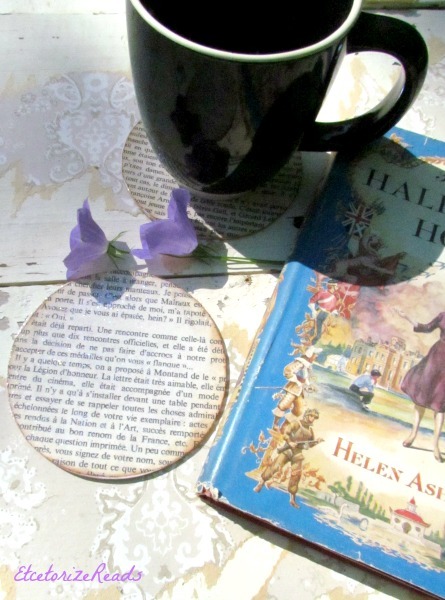 2) My book is in French so I went for the shabby chic look and inked the edges. This step is totally optional. That's it! There you have it, you're own personalized coasters. These are great for those hot summer nights on the deck, with a little hot drink and cool book. And if they happen to go missing, you can just make some new ones! 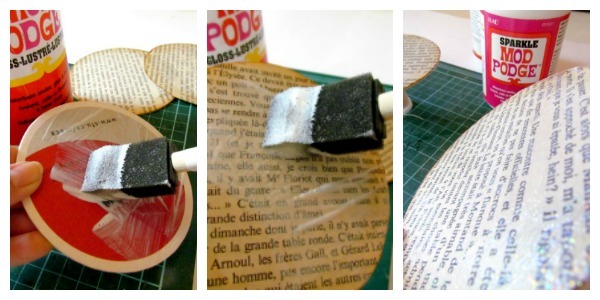 You could get really creative and use comic book pages or outline certain words or phrases on the pages you use to make them stand out. Have fun with it! Award-winning author Matt Rees takes readers to 18th century Austria, where Mozart’s estranged sister Nannerl stumbles into a world of ambition, conspiracy, and immortal music while attempting to uncover the truth about her brother’s suspicious death. Did Mozart’s life end in murder? Nannerl must brave dire circumstances to find out, running afoul of the secret police, the freemasons, and even the Austrian Emperor himself as she delves into a scandal greater than she had ever imagined. Like any well trained classical musician, I've practiced and performed my fair share of Mozart compositions and stand in awe of his genius. I watched the 80's depiction of his life in Amadeus and never could forget the goofy Mozart that Tom Hulce portrayed. 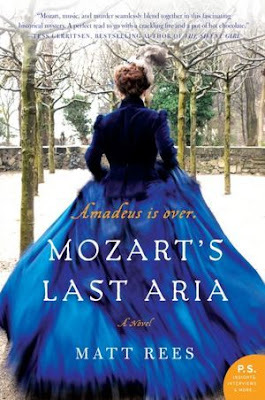 This book though, covering Mozart's death and the following weeks, through the eyes of his sister, is not something that will stay with me for long. Much of it is based on what we know of Mozart's life and his final days, but I found most of Nannerl's story line to be far fetched. If she had been a fictional character I wouldn't have an issue with how she was portrayed, but Maria Anna (Nannerl) was a real woman and depicting such a deeply religious woman as she was in this book was very unfair. If there's proof that she carried out the actions outlined, then by all means, if it's crucial to the story include it. But I doubt any such proof exists. 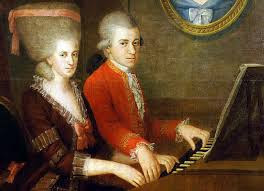 Likewise, it would be nice to think that she had made amends with Mozart's wife after his death, but there is little to substantiate that either. I know the author was really trying to stress how heavily the government of the day felt threatened by the Masons but I found that piece of the story hard to follow and a bit of a stretch. All in all this is a fictional novel that is very loosely based in reality. The writing is good and the story moves along at a good pace, sometimes even a bit too quick, so if you can suspend reality, it's not a bad book. The audio version is performed well with amazing dexterity of all the accents. However, given that there are characters involved who really lived, I think a little more sensitivity to the preservation of their memory could have been afforded. Given the current state of music today it's amazing that Mozart's music has survived, and is still listened to and appreciated, over 200 years later. Do you have a favourite Mozart piece? Who's music today do you think will stand the test of time? Be the first to leave comment below! 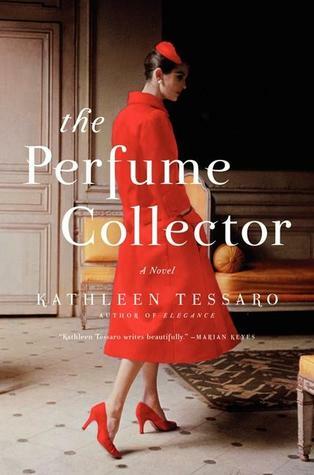 With a cover this gorgeous, how could you resist picking up The Perfume Collector? Keep reading to find out why I like this book so much! Summary (via Goodreads): An inheritance from a mysterious stranger . . .
Review (4/5 stars): I loved this book! Sometimes authors have a difficult time telling a story that switches main characters from one chapter to another as the story unfolds along different timelines but Kathleen Tessaro handles this with ease. I enjoyed all of the characters and loved how each and every one of them evolved throughout. Perhaps Eva's development was rather sudden but I think it was meant to be that way. I was able to fully immerse myself in all of the different worlds that were described, never questioning the validity of the scenarios, only anticipating the moment when everyone's secrets and true desires were finally going to be unveiled for me. 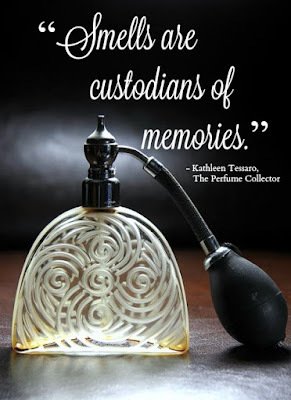 Today anyone and their dog (literally) can make a perfume and name it after themselves, but there was a time when perfume was special. 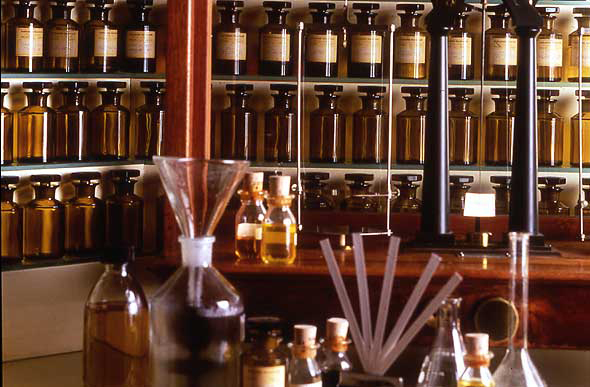 I visited the town of Grasse in France many years ago and took in the free tour of the Fragonard Perfumery. Even though I'm usually quite allergic to scents I found the whole thing fascinating. Have you ever visited a Perfumery? Had a scent made especially for you? Be the first to leave a comment below! 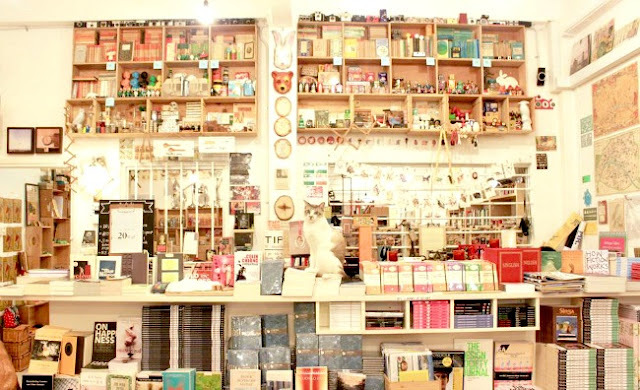 Have you ever heard of Better World Books? 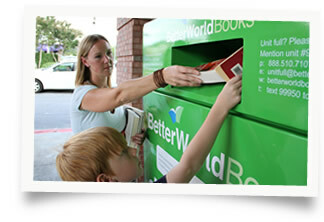 It's a very inspiring social enterprise that started with just one book drive to raise money, and has turned into a company that has raised millions of dollars for literacy, saved millions of books from landfills, created jobs for hundreds of people, and provided wonderful books to millions of readers worldwide. 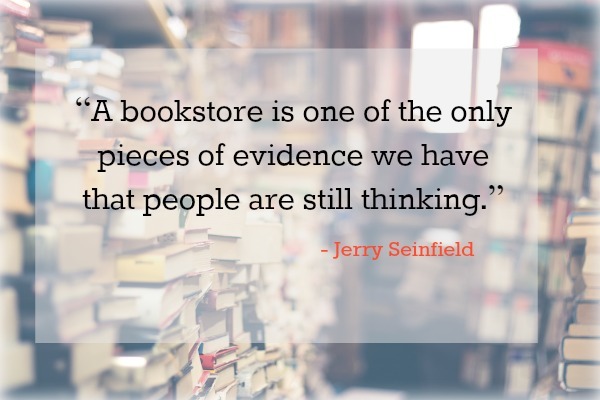 It's simple...they collect used books and resell them. But on top of that they also donate a book to someone in need. They take cast offs from libraries, surplus stock from bookstores, and will even take your used textbooks! If you're in the States and are lucky enough to have one of their handy drop off bins in your community, donating is easy! 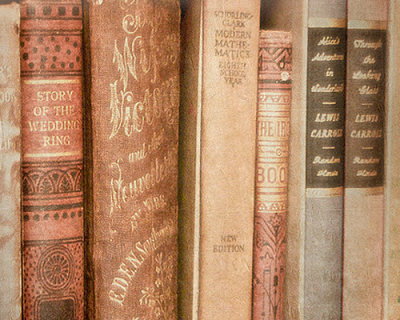 The have loads of categories of books and you can filter selections by price (from under $5 to over $20), condition, format, intended reader age, etc. 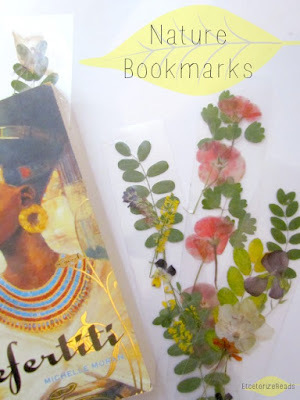 And lots of books have FREE WORLDWIDE SHIPPING! What are you waiting for? Donate or buy and make difference in someone else's life. Check out the Better World Book site for lots of information on the different programs, grants, partners, and more. Disclaimer: I have not included any affiliate links in this post. I'm just really inspired by this company and wanted to share the information. 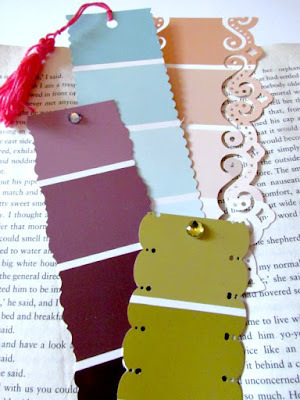 If you like reading and crafting, then this is the perfect super quick DIY for you! 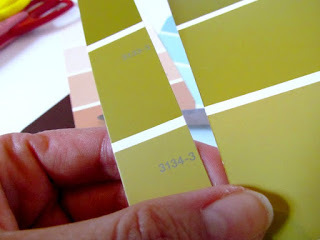 1) Just grab some free paint sample strips (that you probably have in a drawer somewhere) and cut off any text. 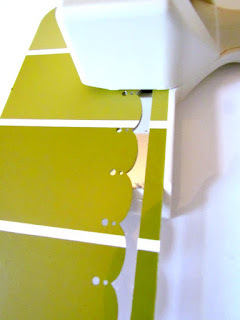 2) Run it through your favourite decorative punch, or just use scissors with fancy edging. 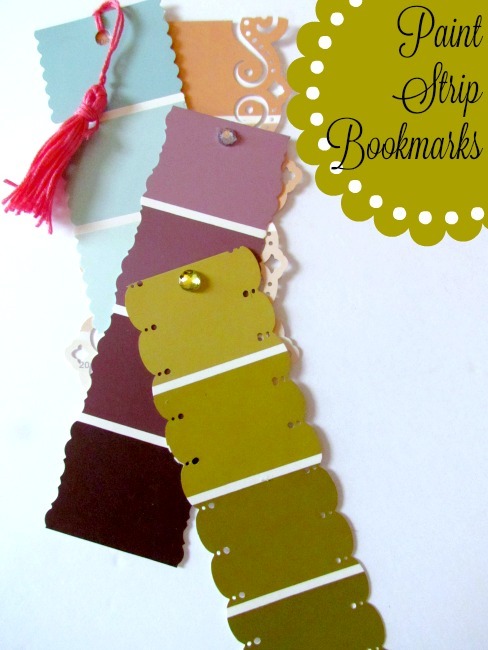 3) Add a tassle, stickers, or pretty rhinestones...and you're done! While we're looking at books that revere that natural world (Signature of All Things), I thought it would be a good time to tell you about this little gem. 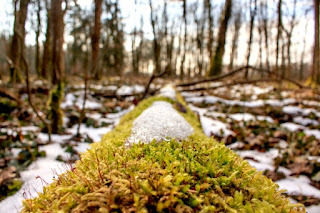 Summary (Via goodreads.com): Young Albert Honig spends much of his time in solitude, his daily routine shaped by the almost mystical attention he quietly lavishes on his bees. Into his tightly repressed existence bursts a brash young neighbour, whose vivacity and boldness begin to transform his life. Yet years pass by, feelings are repressed, opportunities missed. Until one day - led by a trail of bees - Albert discovers her body and is plunged back into his memories, where he must finally confront the lies and secrets that led to their estrangement. In doing so he unearths the truth of Claire’s murder – a question not so much of who but why. Review (4/5 Stars): I'm so glad that I listened to the audio version of this book rather than read it, as I'm fairly certain I would've skimmed right over all of the 'bee' details. All of that information is important to the story though. The relationship been Albert and not only his neighbours, but everyone around him, mimics the bees and how he see's his small world. Although the story was slow in many places, in the end it comes across as more thoughtful than anything else. I loved the little plot twist near the end, giving the readers a small reward for seeing it through right up to the final pages. 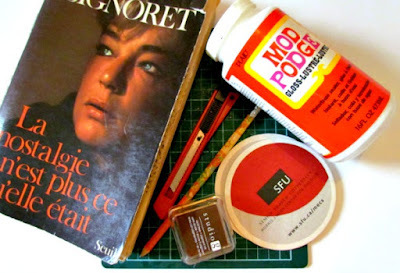 This is not a book to rush through or read bits of while on the beach. Take your time and soak up the honey in each page and you'll be glad you did. 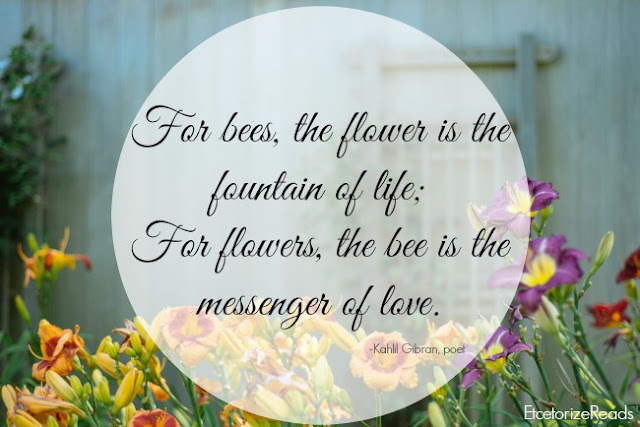 Head over to Beesmatter.ca for loads of information and to enroll in the Buzzing Gardens Program (for FREE). You'll receive a packet of five different seeds, specially selected to attract and nourish bees right in your own yard! Summary (via Goodreads.com): Exquisitely researched and told at a galloping pace, The Signature of All Things soars across the globe—from London to Peru to Philadelphia to Tahiti to Amsterdam, and beyond. Along the way, the story is peopled with unforgettable characters: missionaries, abolitionists, adventurers, astronomers, sea captains, geniuses, and the quite mad. But most memorable of all, it is the story of Alma Whittaker, who — born in the Age of Enlightenment, but living well into the Industrial Revolution — bears witness to that extraordinary moment in human history when all the old assumptions about science, religion, commerce, and class were exploding into dangerous new ideas. 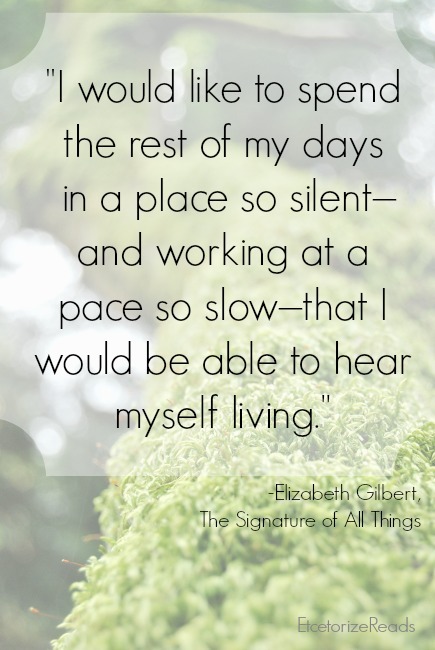 Written in the bold, questing spirit of that singular time, Gilbert's wise, deep, and spellbinding tale is certain to capture the hearts and minds of readers. Ahhh, doesn't that sound lovely? 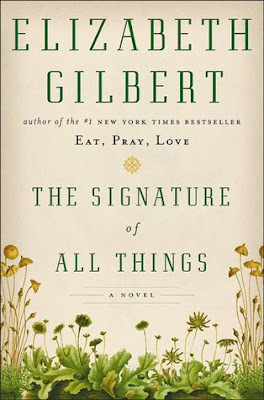 Review (3/5 stars): It's hard to believe that the same author who wrote Eat, Pray, Love and Committed wrote this book. I knew well enough not to expect the same type of semi-autobiographical musings but this is about as far away from that as you can possibly get. 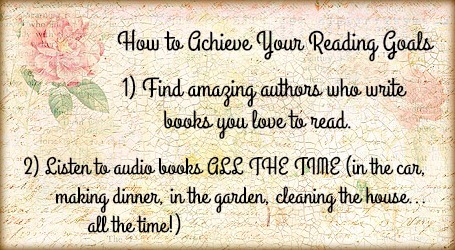 I listened to this book on audio, and although it seemed to be never-ending, I gradually came to enjoy it. However, throughout most of the book I just found myself astounded by the amount of research that must've been conducted by Gilbert to come up with the background details of this story. Which, in the end, aren't background details at all but are really quite central to the final chapters. It took much of the first half of the book for me to begin to like any of the characters but eventually they did grow on me. A book like this is usually about the relationships between all of the characters but I felt that in this book those relationships were merely a tool to get us to the end so that Alma's theories could finally be revealed. There's a great deal of lead up until we meet Alma, who I would consider the main character of the book. I wonder how much of that was necessary but I guess if you want to write an epic, you might as well tell as much as you possibly can. 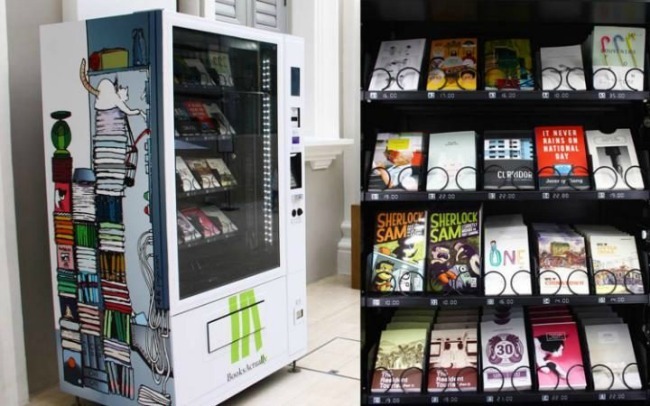 But they've started placing book vending machines in the streets for people who don't have the time to browse the stacks. 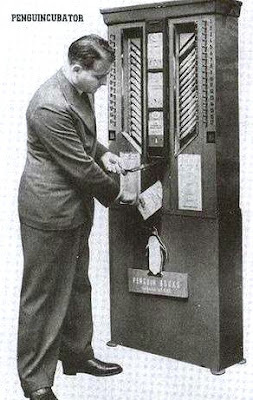 According to The Telegraph, the idea is based on the vending machines that were found in London in the 1930's. Learn more about the Penguincubator HERE. Smart idea? I just keep wondering what happens when you put your $20 or more dollars in and the book gets stuck and doesn't drop, the way candy bars sometimes do. 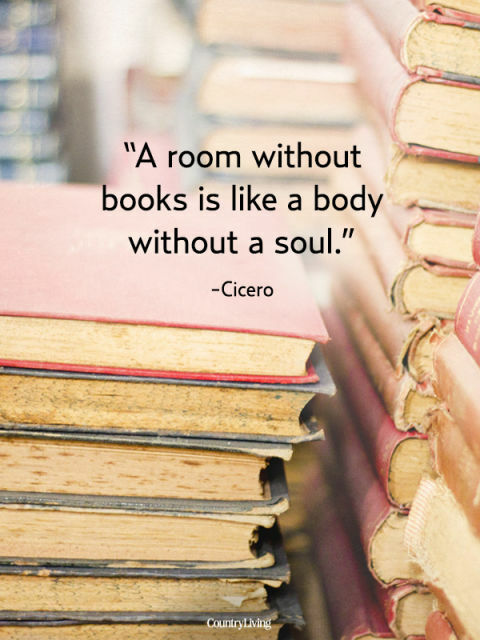 You can walk away from a $2 chocolate bar or bag of chips, but what do you do when your book doesn't come out? What do you think? Would you buy a book from a vending machine or do you prefer to browse the aisles of a book shop? Leave a comment below.